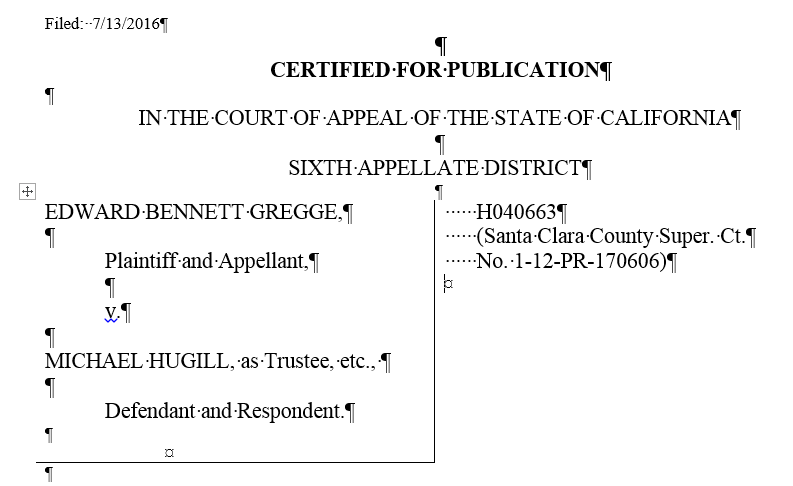 On July 14, 2016, the California Court of Appeal for the Sixth District issued its decision in Gregge v. Hugill, Case No. HO40663. 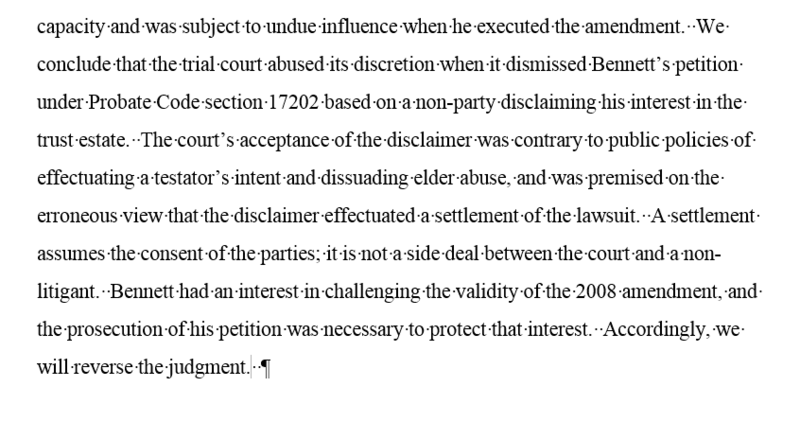 Viewed most simply, the Court determined that Appellant had standing to bring his petition under California Probate Code section 17200 in which he alleged lack of testamentary capacity, undue influence and elder abuse, and that Probate Code section 17202 and another beneficiary’s disclaimer did not operate to defeat or eliminate Appellant’s pecuniary interest and standing to bring his petition and for trial thereon. 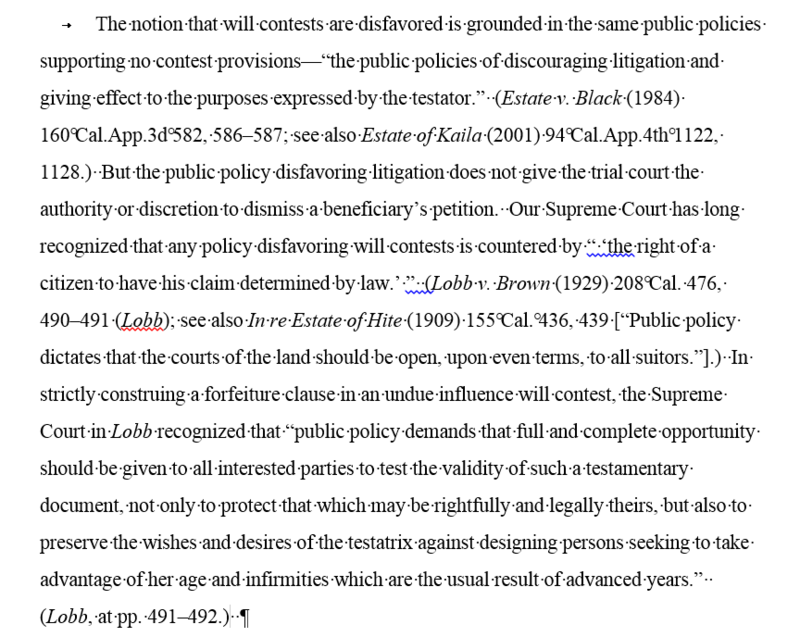 But viewed in its entirety, the decision in Gregge v. Hugill affirms policies that favor a party’s entitlement to a determination on the issues and the claims alleged, arguably disfavors claim forfeiture arguments, and affirms that estate planning document, i.e., will and trust, and inheritance contest determinations and findings should be based on the decedent’s intent. 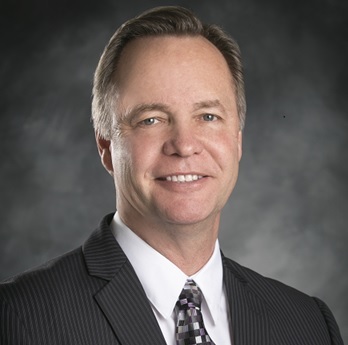 The following are six snapshots from the opinion in Gregge v. Hugill which will provide you with some of the Court’s insight (the first snapshot is only of the case caption).